Located on the north-eastern corner of the Waiouru Peninsula, Auckland, Fisher and Paykel’s Healthcare Office is now a significant feature of the Highbrook Business Park in East Tamaki. 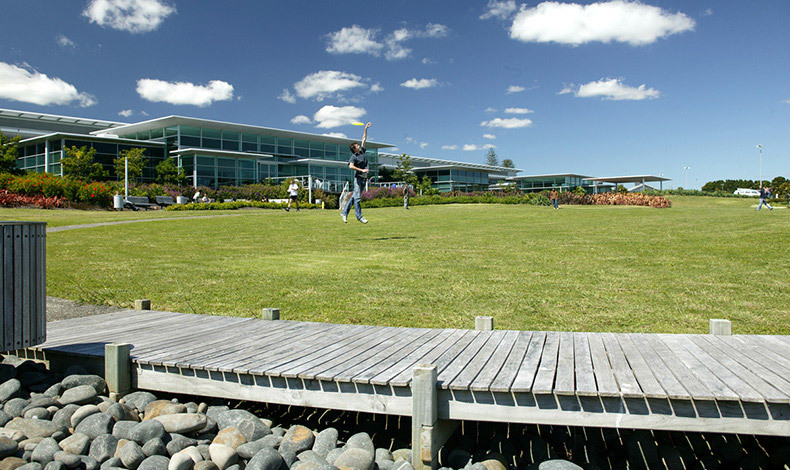 Boffa Miskell had earlier undertaken the landscape design of Fisher & Paykel’s nearby refrigeration / laundry and electronics factory, and were engaged to liaise with the project architects, engineers and the client and develop a comprehensive landscape development plan for the Healthcare Park . We developed concepts for a low intensity, commercial / industrial complex with the overall objective of creating a park like environment. The design creates a central area of open space and focus for the site incorporating storm water treatment ponds, the larger incorporating a water fountain. We prepared the landscape concept / master plan, detailed design including planting plans, documentation and provided construction management of all hard and soft landscape works. We also prepared and lodged all consents. The landscape design ensured that the building and landscape presented an image that represents Fisher & Paykel Healthcare as a progressive and innovative New Zealand Company.